Whatever the outcome of the treasure hunt, it promises to be one hell of a ride. I love what they decided to do for the wait this time around! No worries. Now that you and that other user posted, we understand what happened and that it wasn't malicious. We appreciate the explanation. Now let's get back to having fun with this! I personally can't keep track what we know vs what we're are allowed to know vs what is and is no longer valid. Sorry to say the balloon is officially deflated for me. Pretty sure that it was only images that leaked prematurely and those images have been rendered invalid.There's no other info you're not supposed to know right now. As it stands there are two images that have been confirmed as solutions for 2 puzzles, and it's been confirmed that there's 16 puzzles. The final puzzle will require the solutions for all the 15 previous puzzles to solve. It's also been confirmed that it will take a long time to complete the game - many weeks. As it stands, the puzzles have been given out with approx a week in between, so I assume it's going to be one puzzle per week. All of that info was in the : https://vailrenovations84552723.wordpress.com/dream-theater-working-in-studio/ page. Ooo...16 puzzles in 16 weeks. November should be an exciteful month. "The next puzzle will surely stump you." Is this a reference to The Test That Stumped Them All? The "test" in that song is schizophrenia, right? I don't know if this is connected, but I just found a Freddy Jacobi social media account that does not have a Freddy Jacobi username. In Instagram. Maybe it is not Freddy Jacobi after all. Maybe it is the test that stumped us all. "Pay attention to my social media and look for the keyword “sparrows”. Thats just the same for me. My instagram account name is a derivate of my nick, but the name my account has is my real name. Nothing strange about that. I just find the name very random compared to the account name. Again maybe this is nothing. There’s birds in the art of Octavarium. The ‘o” missing in “In The Presence of Enemies” is only because of twitter’s character limitation in the poll creation. I don't understand anything so far but I will follow this thread to know more about what I don't understand. Ditto for me. The whole treasure hunt idea is a great way to engage with fans. Isn't it more likely that the sparrows refers to the lyrics of Pull Me Under? "Watch the sparrow falling gives new meaning to it all"? But what about "The songbird stops to listen when he sings"
Is it supposed to be like a key chain? 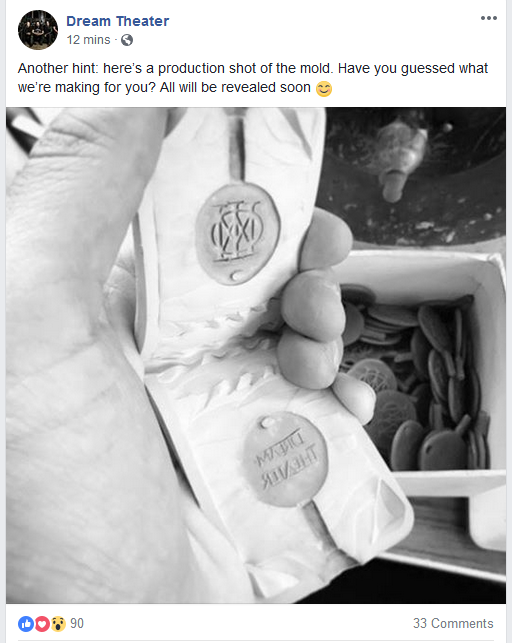 My guess is it's a wax seal. Or maybe it's a coin for shopping carts, to be used by those who don't put them back in the corral. It was announced on FB as well. This maybe is wrong place to say this but DT's merch have been really poor and uninteresting after MP left. They should see what for example Animals as Leaders, Periphery and Haken sell for fans.